The film 90 DAYS has won its first Best Film festival award [Short] at the 2017 Hollywood Reel Independent Film Festival! The festival runs from Feb 16th - 26th and is happening downtown Los Angeles at LA Live! Exact screening time will be announced! Hopefully, you can attend! 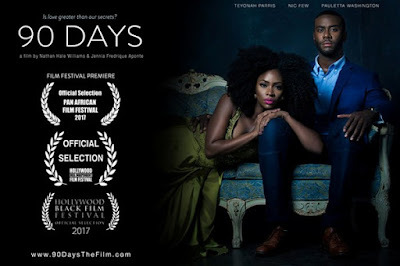 They will also make their Film Festival Premiere at the 25th Annual Pan African Film Festival on Sun Feb 12th at 1 p.m. There will be a powerful Q&A afterward and many of the cast will be in attendance. If you are in Los Angeles, they look forward to seeing you there. Other screening times at this festival are: Mon 2/13 at 9 p.m. and Sun 2/19 at 4 p.m. Tickets can be purchased at http://www.paff.org. 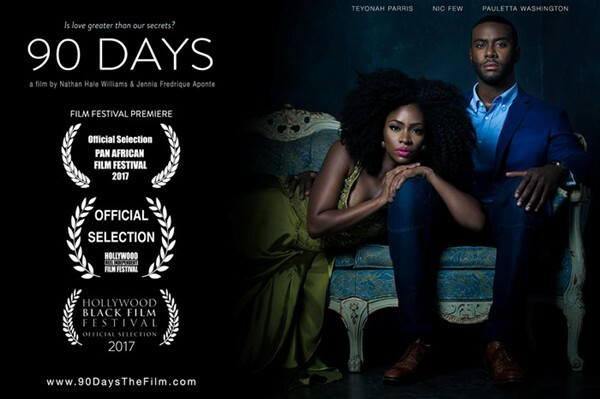 If you can't make it to either one of those screenings, make sure to catch them at the 2017 Hollywood Black Film Festival! Screening times to be announced soon at http://www.hbff.org. Don't worry East Coast! It looks like 90 DAYS will be screening in the New York City area in February as well. We will definitely keep you posted! They are extremely excited to announce that they will be having a private screening on Feb 8th, as an official kickoff event to the 48th Annual NAACP Image Awards! The film 90 Days tells the story of Jessica & Taylor, a fantastic couple who have fallen in love. After ninety days of dating, Jessica and Taylor are forced to confront the realities around living and loving with HIV after one of them reveals he/she is HIV positive.